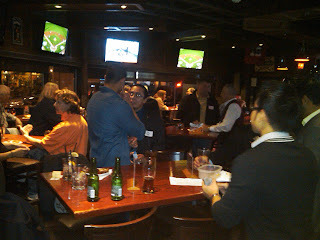 eXmerce Speed Networking Event a Success! Thank you to all members and guests for joining us yesterday evening at the eXmerce Speed Networking event at Toque International Lounge. All of the door proceeds will be in support of The Make A Wish Foundation. Thanks again to Boyd, Owner of Toque for making the space available and preparing the tasty appetizers for our guests; Sunny Sarpal and his Seen My Ad team for guest speaking; Our door prize sponsors – Oxford Learning, Designs by DJ Perez, Journey to Balance, and Smart Executive Group. We hope you built some great connections yesterday! We look forward to seeing you at a future eXmerce event!